Grace Sachs is a New York based therapist who has just written a potential bestselling book based on her years of experience with couples destined for divorce. The basis is of her book is that the women she has counselled through break-ups, should have known there was a problem in their relationship from the beginning. She believes that small signs are present, in all doomed marriages, from the very start. How is it then, that her own marriage, which seemed perfect for the past eighteen years, has now collapsed? Did she not see the signs herself? Should she have known better herself? When a mother at her son's school is found murdered, these questions come to her attention via the NYPD. Marketed as a psychological thriller, this felt more like a study of one woman and her place in the shallow atmosphere of New York's Upper East Side. The first half of the book concentrates on the mine field of private schooling, fundraising events organised by the seriously wealthy, and school gate politics. There is mention of her husband, but in a general way, which leaves the reader not really understanding what direction the novel is taking. The writing style is almost Austen-like at times and it is obvious that Jean Hanff Korelitz is a talented literary author but the style veers off in different directions at times. The second half of the book moves along nicely and the enigmatic husband, and his actions, become more clear. Grace becomes a more confident character, thankfully, and when she is out of New York, the reader gets to see the real her. To me, this was more a book about snobbery. Not only within the context of the private school committee and the world of mega-rich parents trying to keep up with each other, but Grace's attitude to her husband and his role of a successful doctor and how niave she was to believe everything he ever told her. It showed her as guilty of choosing to ignore obvious signs as her patients. How much of this ignorance was to facilitate her role as a perfect New York wife and mother? This is one for reading by the fire rather than a summer read. It demands your attention and should not be approached as a general thriller. There is some beautiful writing in this novel and the overall story is very clever. 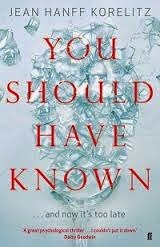 You Should Have Known is published by Faber & Faber and is available in hardcover or ebook format. Hi! I JUST finished this book. I liked it. I liked how the story unfolded, although I do wish there was more of a follow up at the end. I felt like once everything was revealed, the story kind of fizzled out. Good review. I agree with your take on it.